Adobo Pork Chops are thick, spicy, and succulent. The rub that we use adds a lovely tangy flavor to the meat. The pork chops eagerly soak up the Mexican flavor of the adobo and lime rub. The grilled pork chops are full of flavor and the aroma will make your mouth water. We’ll show you how to grill pork chops so that they are the tastiest ones you’ve ever eaten. For this recipe, you will need bone-in loin pork chops, olive oil, smoked paprika, oregano, fresh garlic, cumin, hot red-pepper flakes, fresh lime zest, kosher salt, black pepper. I turned and saw that it was Herb, one of the usuals that frequent the pier. Now, Herb, I must say, is quite a character. He seems to have been just about everywhere and tried just about everything including a stint as a chef. He and I always discussed food and recipes. “Red Chicken?” I wasn’t even sure that was exactly what he’d said. Once we got back home I looked up red chicken and found several references to it. I printed out one recipe that sounded kind of interesting. So, we proceeded to make Red Chicken. Perhaps it was the recipe itself but we found it so-so. Not something we’d go nuts over! Certainly not “blogworthy” as my Honey would term it. Then, one day as I was reading a post from Eat the Love. I realized that I could very well be reading the recipe for the tasty red chicken recipe that Herb had insisted we make. Irwin Lin, the author, had posted a recipe for Meyer LemonAdobo Rubbed Roasted Chicken, a variation, I figured, of the grilled red chicken. The chicken had a beautiful red tinge to it. Now it just so happened we had pork chops thawing out in the fridge! We planned on making them that evening. Grilled Lime Adobo Rubbed Pork Chops. For the pork chops, we decided to stick with lime zest as part of the paste. The adobo pork gets its red color comes from the paprika used in the recipe. But instead of using plain paprika, we decided to the flavor it up a notch by using smoked paprika instead. The hot pepper flakes in the paste give the rub a nice kick. You can always adjust the heat index to your likes and use a few fewer flakes. The rub recipe makes quite a bit so you can store the extra in the refrigerator for a few days or in the freezer for a couple of weeks. It’s excellent not only on grilled pork but also chicken and beef. So, next time instead of making Grilled Lime Adobo Rubbed Pork Chops, try it on grilled or roast chicken. If you like grilled pork chops, you’ll love these recipes. Let us know which one you like the best. We use smoked paprika a lot! Not only do we add it to a lot of recipes, we also like to sprinkle it on top to give the dish additional color. Try smoked paprika and see if it doesn’t give your dishes additional pizzaz!! If you like this recipe please consider giving it a 5-star rating. This helps others to decide whether to try the recipe. 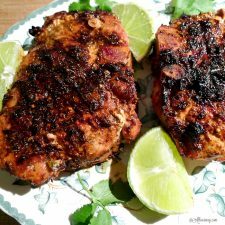 This delicious paste uses the flavors of Mexico plus fresh lime zest to give the rub a lovely note with enough spice to waken your tastebuds We show you how to make perfect pork chops every time. Prepare grill for direct-heat cooking with medium-hot charcoal placing the charcoal on one side of the grill. Cover pork chops with plastic wrap and allow them to marinate, covered and chilled for two hours. 20 minutes before grilling take chops out of the refrigerator. Light the grill and once it is ready oil the grill rack. Grill the chops over coals, turning over occasionally and moving them around if flare-ups occur, until browned, 2 to 3 minutes total. Move chops to area with no coals underneath then cover with inverted roasting pan and grill, turning chops over once, until thermometer inserted horizontally into center of a chop (do not touch bone) registers 145F, 8 to 10 minutes. Transfer to a platter and let stand 5 minutes before serving. Pork can be grilled on a gas grill. Preheat all burners on high covered, 10 minutes. Reduce heat to moderately high and brown chops, covered, turning over occasionally, 2 to 3 minutes. Turn off 1 burner (middle one if there are 3) and put chops above shut-off burner, then grill, covered, without turning, until thermometer registers 145F, 12 to 15 minutes. Pork Chops, rubbed with spice paste, can marinate covered up to 4 hours before grilling. Spice paste keeps, covered and chilled, up to a week in refrigerator and frozen for several weeks. Adapted from Gourmet Magazine's "Grilled Giant Pork Chops with Adobo Paste"
Note: Recipes and content from © All Our Way 2014-2018 are copyright protected. Please do not use content or recipe without prior written permission. If you want to share the information, please link to this post. Grazie. Love this rub you hot here. Simple and all of its ingredient is easily available. This is perfect for weekday dinner menu . Thank you, Shobelyn! We enjoy using rubs on our meats. That chop has a great char on it, just like I like it. And yes, I think I’d try this on chicken, too. Your thick pork chops sound absolutely delicious with the spicy rub. Thank you, Dee!! That is so sweet of you. Have a nice weekend. Men do like their meat, don’t they Natalie? This really is a tasty recipe. I love pork chops. 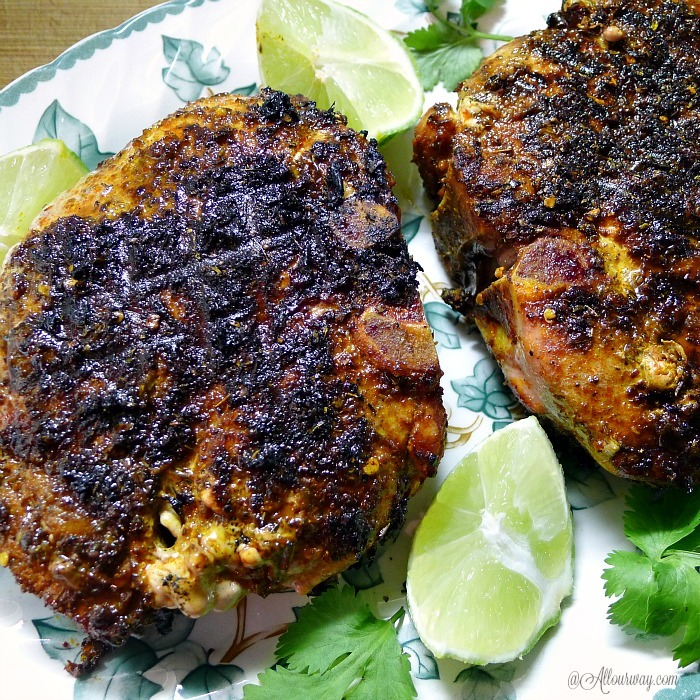 These lime adobo rubbed pork chops are wonderful. Using smoked paprika is a great way to add a nice extra layer of smoky flavor to the chops. Call it fate for my lucky family, pork chops are defrosted in the fridge and I was not sure how I was going to cook them today. Bingo, we have the winning dish! 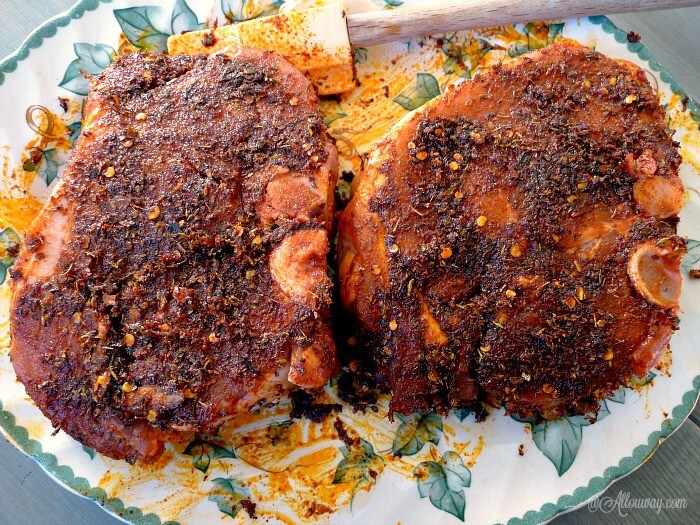 Love the rub you used for these pork chops…looks delicious! These chops look fantastic. Love the seasoning you used. I am so glad grilling season it here. As ambassador for Ontario Pork…this is right up my alley. We are off to the meat market this morning. I think I just might have to pick some chops up and hubby and cook them up for dinner. I will watch, sitting in the backyard with my glass of wine!! Such a flavor packed and delicious looking pork chop recipe. All those spices must have made the dish taste absolutely amazing. Those pork chops look so succulent! Love the rub, I’m sure it’s great n other meats as well. It’s great, Nicole. We use it on chicken too. The spice mixture for this recipe is amazing! I love that these ingredients are always on hand….can’t wait to make this as we are always looking for new ways to spice up pork! Hi, Lauren! You won’t be disappointed. Try it on chicken too. What a delicious sounding rub. 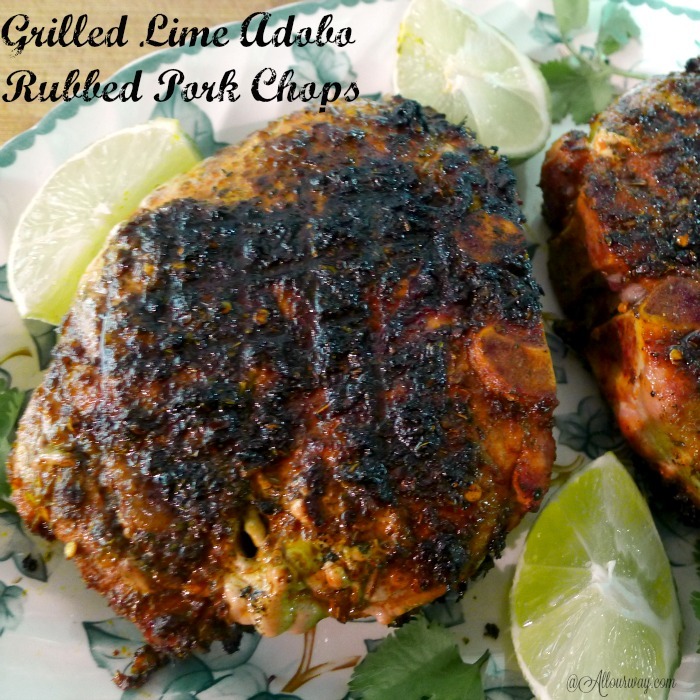 I am always looking for great recipes for pork, Lime is one of my favorite flavors in all meats! That crust looks fabulous! Hi, Claudia! It is a great recipe and delicious on chicken as well. Yes indeed, Linda, red chicken is excellent. The flavors of these pork chops sound amazing. I love adobo, way to spice up dinner! Hi, Trang! Did you know you can make your own adobo sauce? It is great to always have on hand. These are perfect for grilling. I love the crispy coating! Thank you, Marjory. We are always happy when grilling season is finally here. Wow! This looks delicious. I love pork and I love spicy adobo sauce!! It sounds so tasty with all those yummy warm spices! I’ll have to give this a try sometime! Thanks for sharing it! You are very welcome, Amber! If you like spicy, I can guarantee you’ll like the adobo rub. Hi Summer — thank you! Have a nice weekend. Ahhhh! Thank you for yet another flavor packed recipe, my dear! I’m quick to think about using a rub for chicken but never pork! Woohooo!! You’re welcome, Annie. I’m doing the chicken next with the rub!! Buon fine settimana! qui la carne di maiale è molto buona, segno la tua ricetta, deve essere deliziosa Marisa ! Buon fine settimana, un abbraccio ! Thank you Chiara, I would love to be in Italy now tasting the delicious pork!! Have a wonderful weekend and we’ll talk soon. Un abbraccio forte!! Yes , forget the chicken. I’ll take the pork chop. The photos look so tantalizing I can’t wait to try it. Marisa! You really outdid yourself this time – this sounds WONDERFUL! I think it was serendipity too! Adobo lime sounds like a wonderful combination and I’m gonna have to try this too. Thanks for sharing. I pinned it so that I’ll have it for later! Thank you Wendi! It was a really great taste and I’m anxious to try it on different meats. Let me know how you like it. I love love love pork chops and am always looking for new ways to make them. This looks like such a good option. 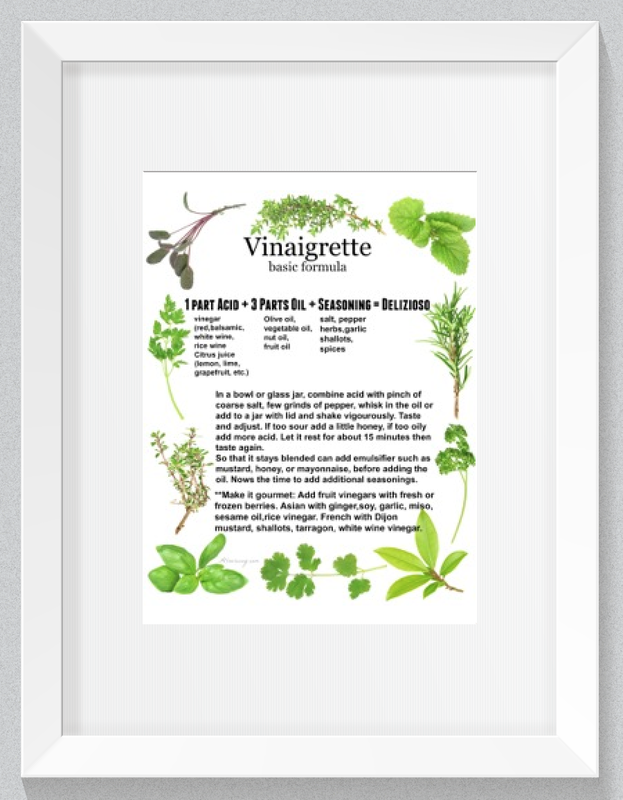 I love that it’s versatile too and can be used on other types of meats! Hi Tracy — you sound like me trying new ways to add flavor to favorites. I’m wanting to try the rub on roast chicken. It sounds like the rub would really bake in. Oh how I love a good pork chop! This flavor combo sounds amazing and I can’t wait to try these out on the hubby! Thanks for sharing! Thank you Felesha! My hubby is a real carnivore and he likes his MEAT!! Hope your hubby enjoys the spicy rub. Marisa, this looks absolutely amazing. That blackened grill looks soooo good. OK, I’m hating my chicken tacos tonight after seeing this. Kids talked me into that one-lol. I want to come to your house for dinner. Oh no Lisa! Chicken tacos are good! When my kids were home they loved those. And you are welcome at our house anytime and I would love to have you join us. We love to share our meals. Hope your week goes great! Hi Christie! It was a very satisfying meal. In fact we had some tasty Italian dressing(stuffing) that we served along with it. This sounds so delicious, Marisa! I LOVE that you added smoked paprika instead! It has such a great flavor. All the flavors/ingredients in the paste sound like a winning combination . . . and I LOVE the RED color! I noticed that in the photo before reading about Herb and his “Reeeeeeeeed Chickn.” lol! What a fun story . 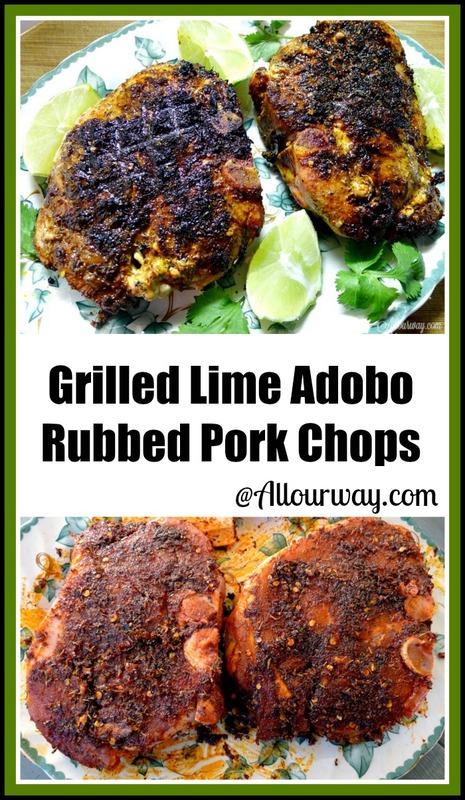 . . and yes, I think it was written in the stars that you made the grilled lime adobo PORK CHOPS!! I’m excited that you shared the recipe with us! I hope you had a great weekend, sweet Lady! Thank you Suzanne!! I did have a great weekend and I haven’t tried using the paste with a roast chicken but I’d like to try. I think the best way would be to spatchcock or butterfly the chicken and then roast it. We love our smoked paprika and our chipotle seasoning — adds a lot of depth. Have a great day and a big hug right back at you!! Wow Marisa – we are on the same wavelength today. I defrosted pork chops overnight and yours look so delicious that I have to make them with your special seasoning. I never heard of red chicken either. I figured it was a southern thing. Looking forward to making these pork chops tonight. Thanks for the recipe. Hi Denise! I don’t see why it couldn’t work in a smoker. From what I understand smokers aren’t high in heat and the only concern I would have would be charring the outside — that shouldn’t be the case with the smoker since it cooks it slowly. Yum!! Please let me know how it turns out. You have put some amazing flavors on that pork chop!! I especially love the heat! Well Ramona, if you like heat you can always add a few more pepper flakes. We love spicy too. Thank you for stopping.